Types of Mesothelioma | The Williams Law Firm, P.C. The term mesothelioma applies to various types of this deadly cancer that is caused by asbestos exposure. Asbestos is a heat-resistant compound that has been used for over a century in a variety of fields including roofing, insulation, HVAC, ship-building, and more. While the government has warned for decades that asbestos fibers can be harmful to those who inhale them, many companies did not take steps to properly protect their workers and their families. Because of this, there may be significant compensation for those diagnosed with mesothelioma. The Williams Law Firm understands the far-reaching impacts of mesothelioma on victims and their family members. New York attorney Joseph P. Williams and the team at The Williams Law Firm are knowledgeable and aggressive advocates for asbestos exposure victims, and we have extensive success helping mesothelioma victims and their families across the United States recover the financial security they need for medical care and peace of mind. To learn more about your legal options during this difficult time, call our office at 855-575-MESO (6376) for a free consultation or contact us online. 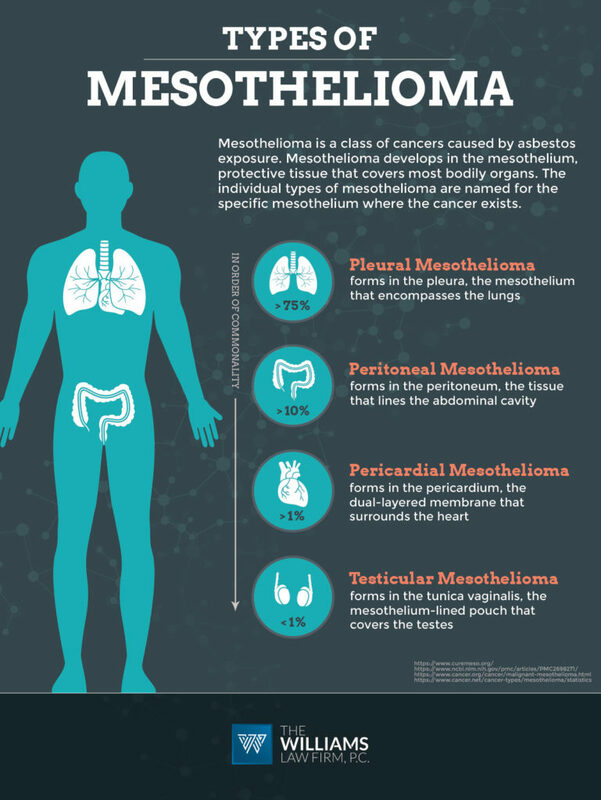 Mesothelioma is a preventable but fatal form of cancer that develops in the protective membrane known as the mesothelium, a layer of tissue that covers most internal organs. Following is a closer look at each of these primary mesothelioma types. Pleural mesothelioma is the most common form of mesothelioma. Pleural mesothelioma develops in the pleura–two layers of protective tissue known as mesothelium that surround the lungs–and is caused by asbestos exposure. The particles from asbestos fibers are difficult for the body to filter, and with progressive exposure these asbestos particulates accumulate in the pleura, where they often lead to inflammation and scarring. Over time, the asbestos particles contribute to genetic changes in the cellular makeup of the pleura, causing the cells to become cancerous. As mesothelioma tumors form, fluid begins to build up between the layers of pleura, which puts pressure on the lungs and results in chest pain and impaired breathing. Pleural mesothelioma accounts for approximately three-quarters of all mesothelioma cases. Although mesothelioma tumors tend to spread throughout the body, they most often originate in the pleura. The peritoneum is a thin membrane that lines the abdominal cavity and helps lubricate internal organs, allowing them to contract and expand within their normal function. Peritoneal mesothelioma initially causes a gradual thickening of the peritoneum. As the disease progresses, a buildup of fluids and/or mesothelioma tumors develop, placing pressure on the internal organs and producing significant abdominal pain. Like all types of mesothelioma, peritoneal mesothelioma is a direct result of asbestos exposure and generally has a latency period of about 20 to 50 years. Perhaps due to the latency period, peritoneal mesothelioma is often mistaken in its early stages for minor abdominal issues or a hernia. If you have been exposed to asbestos at any point in your life, it is important to be aware of this condition and to talk to your doctor immediately if you begin to develop symptoms of this disease. The pericardium is the dual-layered membrane that surrounds the heart. It is responsible for lubricating the heart, preventing excessive dilation, protecting against infection and limiting heart movement. Linked to asbestos exposure, pericardial mesothelioma forms in the pericardium. Though it is one of the rarest types of mesothelioma, pericardial mesothelioma affects twice as many men as women and is often not diagnosed unit the disease is in an advanced stage. It can take decades, sometimes upward of 50 years, for pericardial mesothelioma to exhibit symptoms. Because of mesothelioma’s long latency period, it’s a good idea to talk to your doctor if you believe you may have been exposed to asbestos. Although there is no cure for pericardial mesothelioma, it is possible to extend life expectancy and improve quality of life with early detection and treatment. Testicular mesothelioma is the rarest form of mesothelioma. The rarity of this disease does not, however, make testicular mesothelioma any less deadly than other types of mesothelioma. Testicular mesothelioma develops in the tunica vaginalis, which is the mesothelium-lined pouch that contains the testes. Just as pleural mesothelioma may be misdiagnosed as another form of lung cancer, testicular mesothelioma is often confused with other medical conditions. This makes getting an exact count on the number of individuals who have previously and are currently suffering from it all the more difficult. However, when properly diagnosed, patients with testicular mesothelioma typically have a slightly better prognosis than those with pleural or peritoneal mesothelioma—20 months or longer with proper treatment such as surgery, chemotherapy and radiation. When talking to your healthcare provider, it is important to remember that asbestos exposure is the only known cause of mesothelioma. Men who have been exposed to the substance through work or other means should inform their doctors right away should any mesothelioma symptoms become present. Properly diagnosing mesothelioma is essential for life-extending treatments. All types of mesothelioma have a long latency period, which means mesothelioma symptoms are often not evident for upward of 25 or more years until the disease has progressed to an advanced stage. Complicating mesothelioma diagnosis and treatment is the fact that many preliminary symptoms are shared by other medical conditions. Because of this, mesothelioma often goes undiagnosed for years, even decades, leaving the sufferer worse off by the time they get treatment. Mesothelioma treatment is most effective when the disease is caught early. Stage 1 mesothelioma treatment may initially focus on surgical options such as a peritonectomy to remove abdominal malignancies. For more advanced stages, cytoreductive surgery, in which multiple surgeries are used to remove parts of the abdomen and gall bladder, may also be recommended. Both of these procedures must be combined with chemotherapy to control the spread of the cancer as well as improve life expectancy and quality of life. Unfortunately, mesothelioma is often not diagnosed until the cancer is in an advanced stage, rendering curative treatments ineffective. There are many trials and experimental drugs that are currently being tested to see if they have any effect on mesothelioma cancer cells, but so far nothing has come to be considered better than chemotherapy and radiation. If you or a family member suffers from mesothelioma, The Williams Law Firm is here to help you pursue the financial security you need to cope with medical costs and other expenses. Led by accomplished New York asbestos exposure attorney Joseph P. Williams, our legal team has recovered millions of dollars on behalf of mesothelioma victims and their families from across the country. Please call us today at 855-575-MESO (6376) to arrange your free, no-obligation consultation or contact us online to tell us your story now.